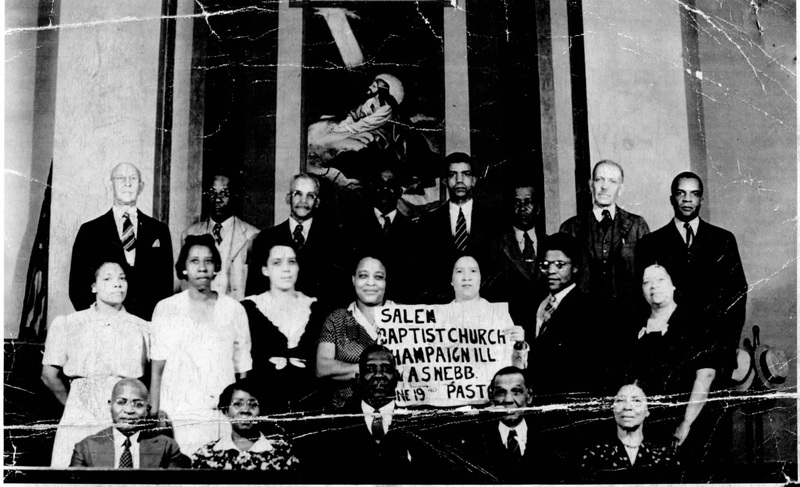 Photograph of members of Salem Baptist Church. Photographed include: Rev. O.B. Johnson, Mrs. Garland, Rev. Webb, Rev. Martin, Mrs. Benton, Mrs. Bowles, Blanche Johnson, Ruth Hendricks, Mrs. Clark, Harriet Chandler, Albert McKinley Jr., Mrs. Merrifield, Mr. Benton, Mr. Garland, Mr. Chandler, Mr. David Sayler, Mr. Mareland, Mr. Charlie Brown. NOTE: NOT ALL INDIVIDUALS IN THIS PHOTOGRAPH HAVE BEEN IDENTIFIED CORRECTLY. Please send corrections to nlenstr2@illinois.edu. 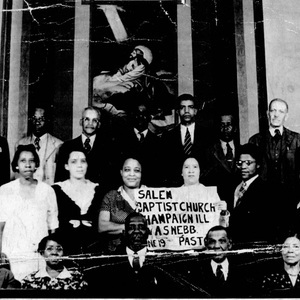 “Salem Baptist Church photograph,” eBlack Champaign-Urbana, accessed April 23, 2019, http://eblackcu.net/portal/items/show/185.